Every now and again, I look out the window at the endless, tedious landscape of frozen tundra and fantasize about things like flowers. And grass. And anything green versus endless sluggish grayish-white. Surely in some world, this must exist?? But it’s coming, really. I know Spring is on it’s way. I see prompts of it’s arrival on my calendar and in the pile of sweet pretty dresses hanging in my daughter’s closet. We will get there. In the meantime, as we await daffodils and warm rain showers, we’re hanging out with another fun reminder of warmer days with our shiny new Strider Bike. He knew that Strider is onto an important concept: their 12 Sport’s simple, no-pedal design builds confidence and eliminates fear by allowing kids to have their feet on the ground and progress at their own pace. This unique design teaches young children balance on two wheels right from the start, avoiding developmental delays typical with tricycles and training-wheel bikes. The age range? Perfect for toddler up to age 5. Huh. Apparently Strider’s no-pedal design was a super idea for my 3 and 5 year old, who are still learning to ride, especially as my son’s leg break issues have made this trickier for us. Strider’s 12 Sport model offers a bunch of features that make getting the hang of bike-riding easy and fun: there are custom grips, a padded saddle, handlebar pads, and quick release clamps (no-tool adjustment). A perfect balance of performance, options, and value. So we snatched up the green model (it comes in a choice of seven colors) and gave it lots of test runs in our basement--we’ll tackle the driveway when it’s a tad less snow-covered. The thing is, my kids love it. They love the challenge it presents, but more they love that they feel capable in navigating this bike. I love that is growing their skills and improving their balance. We’re all delighted with this bike. Also, we’re insanely ready for Spring. The good news for you? 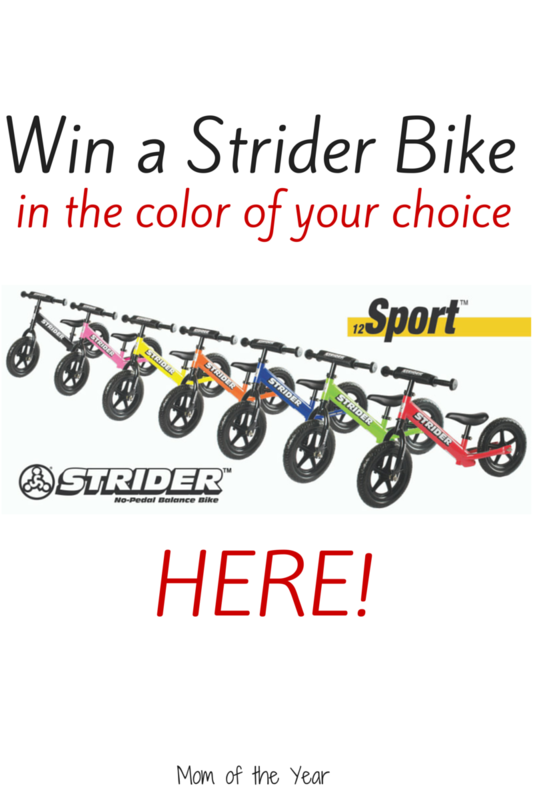 YOU can get hyped up for the warmer temps with us as I’m giving away one Strider Bike here, in the color of your choice! As long as you are 18 or above and live in the Continental United States, you are eligible to enter. Giveaway will close on 2/26/15 at 5am ET. This is only open to my readers, so hop in on this giveaway and get ready to win! I can’t wait to share this genius, Spring-ready bike with one of you! 2/27/15 UPDATE: Congrats to winner Diane B.! Ohhhh! I want one for my girls. Elijah just learned on his ugly, trashed picked bike with the pedals removed. My younger daughter could so use this and totally entering. And by the way, I keep saying the same thing about spring, because the frozen tundra look outside my own window is just too depressing for words. 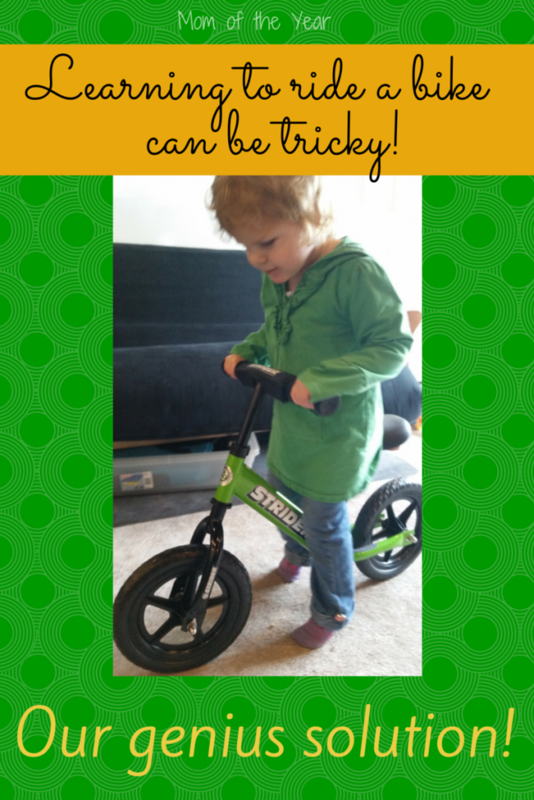 Strider bike is the perfect way to teach your LO to balance on a bike! LOVE these bikes!! I SO WISH my son had had one. Took him so long to get the balance thing down. I’d love this for my toddler! Haha it is me again!! Trying to win for my boy! Wow these are great!! Having a child with special needs I know that when they teach kids to ride a bike they take the pedals off the bikes, but I did not know that a company actually made them this way! Excellent!! I would really love to win. It would be a great birthday present that I can’t afford. Gahhhh, I need this bike for my goddaughter!!! So fun! Love it! My toddler would love this! Those are adorable. These are so adorable – would love to win for my niece! I’ve been struggling with how to get my toddler to transition from her tricycle to the Big Kid bikes she’s afraid of – this would be perfect! This would make an awesome gift for my godson! What a great way to get them outside and moving! My kid is struggling learning to ride his bike. This would help so much! I’d love one of these for my son who gets physical therapy. It’s hard for him to pedal a bike, but he needs to strengthen his legs. This looks like good practice! Pretty sure I saw this on Shark Tank! Would love to win because they seem awesome and I have toddlers. These look like fun! My little one would love this!! I hope I win for my nephew!!! I should like to win this Stryder bike for our little one who is going to be two soon. He’s very athletic and energetic. I think this would be a great way for him to learn to ride a bicycle. Love the concept of these bikes! I would love to get this bike for our little cousins! These things are awesome! We don’t have one but I plan to teach two more boys the art of two wheels this spring. I can’t believe there are still bikes with training wheels. 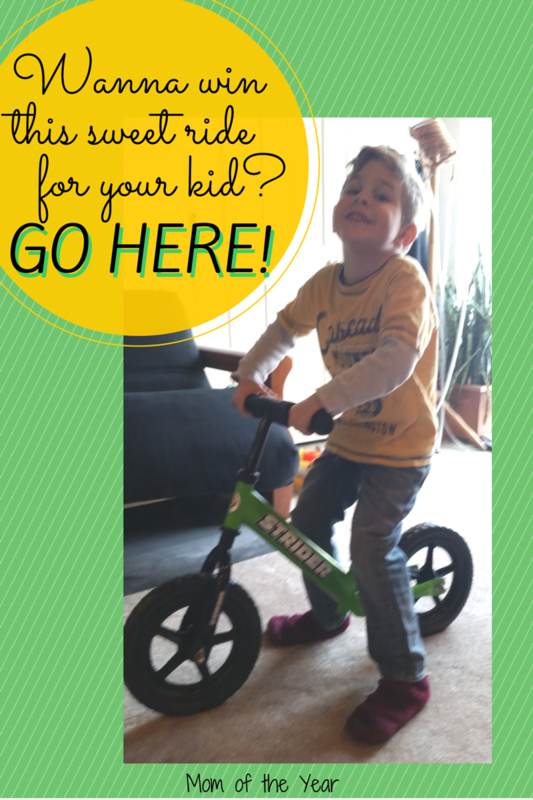 Petal free bikes are a million times easier for little ones to learn balance! I’d love to win this! Seems like a great first bike for my son! My friend’s 2 yr old would I’m sure have fun with this! My little one desperately wants to bike like her big sis, but she’s so tiny that we can’t get her one small enough! My little boy would love to win this. It’s going to be such a fun summer with a 4 year old. We live in a nice neighborhood with bike paths!